This post will delve a fair amount into specific mechanics of Ingress and Pokémon Go. I will try my best to provide a good context of relevant details and aspects for those that have not played the games. 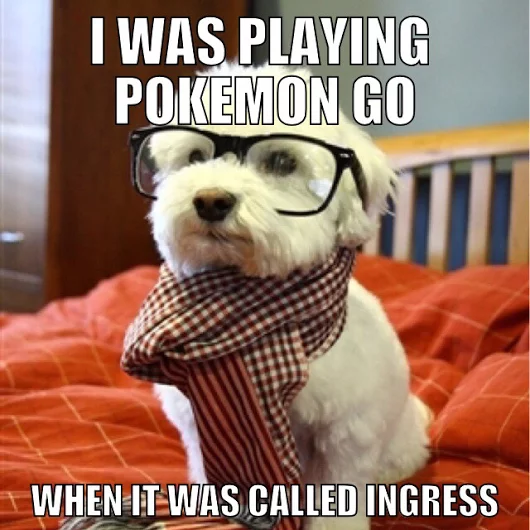 Although Ingress is older than Pokémon Go by several years, I only started playing Ingress after I started playing Pokémon Go. 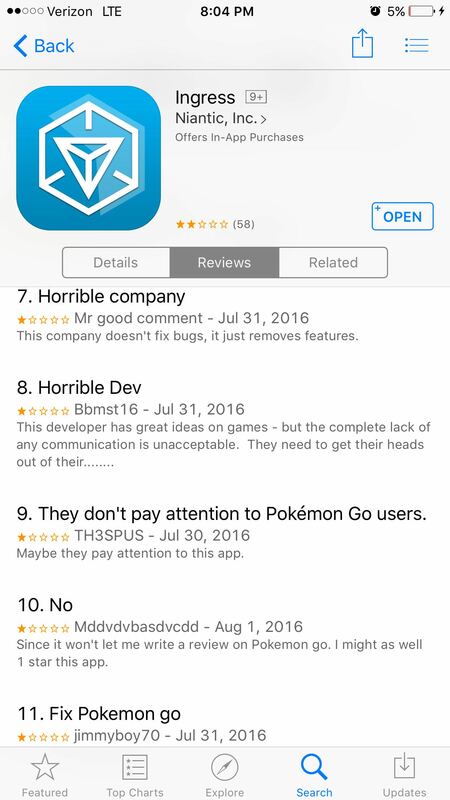 On top of this, I started playing Pokémon Go more than a month after release, at a point when many have already quit. I’ve on several occasions had the pleasure to listen to stories from Ingress players that have been there from the beginning, and thus got to learn, for instance, how even though Ingress seems really stable now, Ingress’ first few months were actually as painfully glitch-ridden as Pokémon Go’s. (So given this and how much of Pokémon Go entities are taken from Ingress, why didn’t Niantic do it right this time around given how well Ingress has come to run?) It’s really interesting to find out about the various ways veteran Ingress players view the rise of Pokémon Go and the Pokémon Go community. I will start with pointing out that the current four most upvoted posts to r/Ingress all remark on Ingress and its relation to Pokémon Go. It’s pretty much impossible to be an Ingress player unaware of the presence of Pokémon Go, whereas it’s quite possible to be the other way around. And there are quite a significant number of such Pokémon Go players. Many Ingress players have some quite extended opinions and thoughts about Pokémon Go players and the newer game’s incredible rise. One thought I hear substantially frequently is that Pokémon Go players are very obvious and open about their playing, a thought conveyed sometimes as just an observation but sometimes with annoyance. 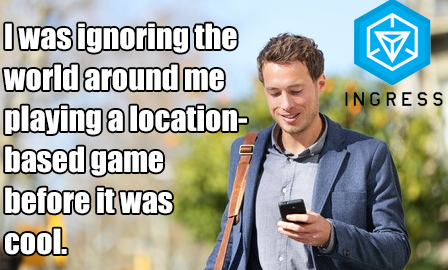 It is in fact the case: Pokémon Go players usually make no effort to hide themselves as Pokémon Go players, whereas Ingress players much more tend to operate subtly and secretly. There’s several conventions that are likely contributing factors. Players in Pokémon Go are ‘trainers’, in a Pokémon context. Players in Ingress are ‘agents’, in a sci-fi context. Ingress’ backstory much further suggests to the player that the role they are taking in the game is one associated with subtle operating. Pokémon Go has frequent (several occurrences a day) events—called ‘raids’—that often require people to work together in groups, and thus to actively look for and contact other Pokémon Go players, including from other teams. There is no such parallel in Ingress. Many people often pull large operations in groups with their faction, but these are also executed in elevated secrecy to those not in on the operation, and for good reason, as will be touched on later. Although both communities acknowledge the issue of GPS spoofers, Pokémon Go has had substantial enough of a spoofer problem that people are quite actively wary for spoofers. Letting oneself be visible to others when taking action (attacking a gym, participating in a raid) confirms to them that one has brought their physical body to an area, demonstrating playing honestly. There is no corresponding confirmation tendency in the Ingress community. But this difference in openness of playing actually also parallels differences in strategy in optimal playing between the two games. Pokémon Go has reached a point where attacking and defending are very well balanced. (And this is something I think Niantic should get lots of credit for: despite numerous major failures in the infancy of Pokémon Go, it has managed to bring about a gym situation that is substantially interesting while dynamic.) If a high-level experienced player attacks a gym, and a high-level experienced player that has deployed a good defending Pokémon to the gym notices and defends the gym, the likely result is a war of attrition of resources: for both the attacker and the defender, it is substantially more likely that they will give up because it will be unreasonably costly to continue rather than because the other player has the intrinsic advantage of attacking or defending. Of course, it could really tip the scales if more people come to aid one side. This is not true in Ingress. In Ingress, a determined attacker easily overwhelms a defender, even if the defender is putting the highest effort into defense. Although Ingress allows for remote defense of its entities (‘portals’) like Pokémon Go, the defending action (‘recharging’) is not much faster than attacking actions (thus being more time-intensive), and defending is health-costly. Moreover, even if a defender keeps recharging, an attacker likely has at disposal an item that instantly flips the faction alignment of a portal, that defender cannot do anything about. This item is very rare, but it’s not rare enough to prevent me from currently having over a hundred (after having used a dozen or so in the past). As one of these items can be used on a portal every 30 minutes, any determined attacker knows that they are guaranteed the portal is theirs within 30 minutes, usually much less, if they really want. What this means is that in Ingress, one simply cannot rely on vigilance for best practices in protecting what one cares about; one needs to rely on stealth. The path of greatest likely success in defense is the path of acting such that one is most likely unnoticed. In fact, secrecy is so important that best-practice advice in defending what one most cares about is to not defend portals when they get attacked and hope the attacker does not decide to care too much about that particular portal, then discreetly recharge the portal afterwards: defending while the attacker is attacking signals to the attacker one cares about that portal. Optimal strategy in Ingress prefers the secretive. This analysis, of course, is far from a causal link between strategy and culture, but it is quite a reflection that would still be interesting as a coincidence. At the center of this is the Guardian medal issue. Both Ingress and Pokémon Go award medals to players for reaching certain elevated quantities in particular statistics, for instance capturing portals in Ingress and catching Pokémon in Pokémon Go. Ingress awards bronze, silver, gold, platinum, and onyx medals, in increasing order of achievements. Pokémon Go just awards bronze, silver, and gold medals. The Guardian medal in Ingress is awarded for having continuous control of a portal for a time duration: 3 days for bronze, 10 days for silver, 20 days for gold, 90 days for platinum, and 150 days for onyx. Guardian is special among the Ingress medals as the only medal one cannot achieve through purely one’s persevering effort. Whereas one could just keep deploying resonators or continue walking to achieve a certain level of the medals for, respectively, resonators deployed or distance walked, perseverance alone will not cut it for Guardian; one’s streak at one’s Guardian portal can be crushed by the enemy—and as mentioned above, easily, sometimes even without intention. As for my personal experience, I didn’t dedicate myself to going far away for chances at a better Guardian portal, and tried to do my best in the general vicinity of Cambridge. I actually achieved gold (20 days) accidentally, that is, without intending to work towards Guardian. My first serious attempt at a Guardian was cut down on day 57. I then went and picked a portal that is substantially off the beaten path, and that portal was neutralized on day 90, earning me the platinum medal. Given the location of that portal off the beaten path and the timing, it was almost certainly the case that that portal was Guardian-hunted but the attacker mistimed. My next choice was not actually much off the beaten path, so that it may have a better chance at blending in as a normal portal, but it was also neutralized on day 90—another mistiming, by a different Guardian hunter. My last attempt actually carried me to day 121: it was a fairly mundane choice: the Simmons Hall portal. Honestly, given how my off-the-beaten-path choice only lasted me until day 90, I was frankly surprised the local Enlightened allowed me to get away with controlling the Simmons Hall portal for 121 consecutive days. Nothing since has gotten me close. Why am I now willing to divulge on my blog such detail on my Guardian attempts? Because a few days ago, Niantic announced they will stop awarding the Guardian medal in Ingress. On the happy side, this crazed, elaborate dance will be no more, but on the sad side, this crazed, elaborate dance will be no more. Game dynamics around the Guardian medal are frankly quite a thrill and a substantial part of Ingress. But in its pertinence to the prior point, it would be interesting if this de-emphasization of the most intensely secretive part of Ingress ends up having some effect of the culture of Ingress becoming more open and less secretive.